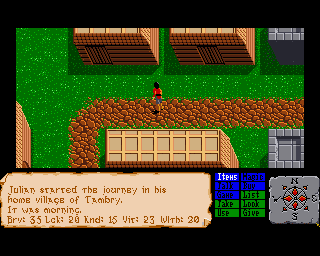 I've been playing some old Amiga 500 games recently, emulated on my PC. In particular, I've been playing The Faery Tale. It's so cool. OK, maybe it's mostly cool because I played this for weeks and weeks non stop in 1987 or thereabouts when it was fresh. 20 years ago, this game was state of the art. The graphics and sound were awesome, the RPG element quite good, certainly new at the time. The sheer scale of the game world unbelieveable. Today, ok, the graphics are a little blocky to say the least, but I can still whistle along to the sound track although you can count the number of sound channels. My son has quite taken to it and is happy to sit next to me playing it for hours. heh. The game is still challenging to start. Just surviving is hard work. But then you get the turtle, and a cheat in the game that lets you attack your friendly ride, increases your Bravery points, and you become nearly invincible. Which is lucky really, because the rest of the game requires a lot of exploration where you can't afford to die. I'm going to try not to cheat too much otherwise. Damn, this is fun. Next I'll get Elite. That was awesome too.